Maria Theresia Paar (1746-1818) was the daughter of Prince Johann Joseph Paar (1719-1792) and Countess Antonia Esterhazy (1719-1771), and the wife of Count Johann Josef Bucquoi (died 1803). The portrait was commissioned by the sitter's brother, Prince Wenzel Paar, with whose descendants it remained for over a century. 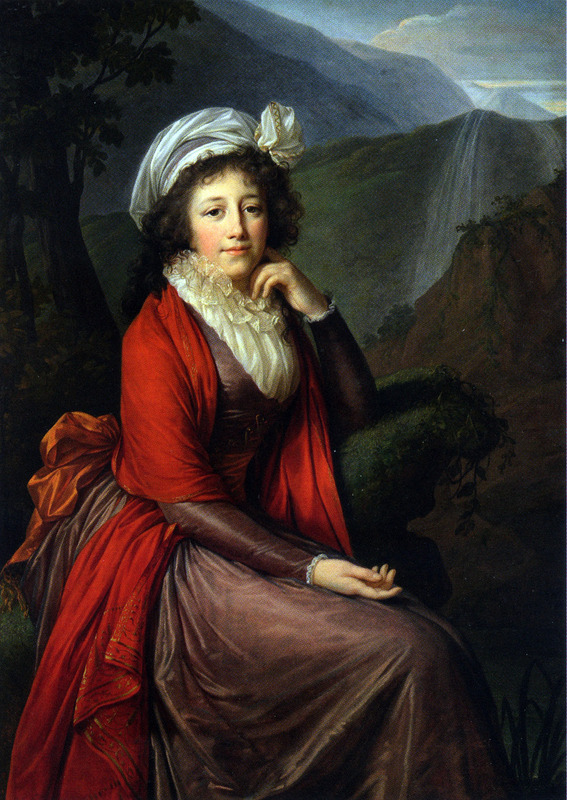 Vigee Le Brun specifically recalls the painting in her Souvenirs, when referring to the hospitality accorded to her by her Austrian patrons during her stay in Vienna. Upon its completion, the portrait was displayed in the salon of the palace of Prince Paar, where as the artist herself recorded, its exceptionally vibrant color scheme would have clashed with the white boiseries of the room. Accordingly, green velvet hangings were improvised to soften the contrast, and Prince Paar himself devised a sort of reflecting candelabra to light the picture. The pose derives from the artist's portrait of Queen Maria Carolina of Naples (fig. 34) and thus Indirectly from the portrait of the Duchesse d'Orleans (cat. no. 28). The autumnal landscape backdrop has its prototype in the portrait of Countess Potocka (cat. no. 34), but it also reflects the mountainous scenery along the river Danube where Vigee Le Brun painted a number of landscapes. PROVENANCE: Collection of Prince Wenzel Paar and his descendants, Vienna; acquired in 1948 by Wildenstein, Paris and New York; purchased in 1978 by The Minneapolis Institute of Arts with The William Hood Dunwoody Fund. SELECTED REFERENCES: Souvenirs, 11, 220, 371; "Accessions for the Year 1978, "The Minneapolis Institute of Arts Bulletin, LXIV, 1978-1980, p. 115, no. 5, illus. MAJOR EXHIBITIONS: Sao Paolo, Museo de Arte, O Retrato na Franca, January 1952, no. 26, illus. ; Paris, Gazette des Beaux-Arts, De Watteau a Prud'hon, May 11-31, 1956, no. 90; Los Angeles County Museum of Art, Women Artists: 1550-1950 (cat. entry by A. Sutherland Harris), December 21, 1976-March 13, 1977, no. 60, illus. (exhibition traveled in 1977 to Austin, Texas, University Art Museum; Pittsburgh, Carnegie Institute; and The Brooklyn Museum).